the old one was dull, green and impossible to get a hold of. 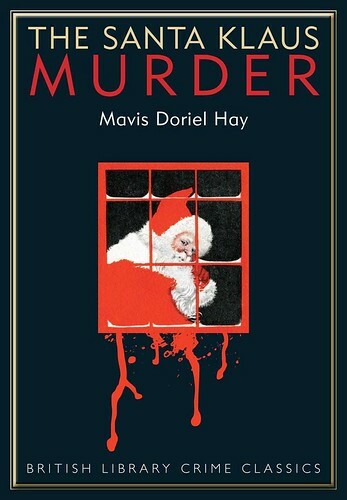 If you have not heard of this book, or of Mavis Doriel Hay for that matter, that is probably not your fault (I don't think she even has a wikipedia page, which in this day and age must be the height of obscurity). I came across the novel by chance, and only thanks to the British Library's recent effort to republish out of print crime classics in its collection (of which I now own a surprising number). The book was originally published by Skeffington & sons in 1936 as The Santa Klaus Murder; compiled by M. Doriel Hay from the accounts written by several of those concerned; but that edition has been out of print for ages, and there aren't even used copies to be had on all of ViaLibri, except the recent British Library edition (though that does not keep some people from trying to charge nearly £50 for a new soft-cover book that is now very much in print). Its publication date places it squarely in the Golden Age of detective fiction, and it shows several indications of that. For example, I think it follows all the rules on Ronald Knox' Detective Story Decalogue (though it does fall short of some on S.S. Van Dine's rather more extreme list -- then again, I don't know of many good detective novels that don't). It is a wonderfully readable classic country house murder mystery from the interwar period. Think Agatha Christie with less psychology and more keeping track of the layout of the house. I have never quite been able to fall in love with this kind of murder mystery (which I think of as the Ellery Queen kind), mainly because the ups and downs and expecting you to be able to work it out yourself is rather too much work for me. But I quite enjoyed this one (though it does seem to be influenced by the Ellery Queen school). In part, this was because it included a number of inserted accounts by witnesses with their own voice. In fact, it opens with five witness statements, setting the tone. This got fairly unsettling (in a good way) once the Chief Constable arrived on the scene and started suspecting them all. It may be that this is a problem particular to me; I am dreadfully gullible, and while I know first person narrators can be horrible, lying liars, I still tend to automatically organise my understanding of events based on the way it is first presented to me. It takes a fairly large signal for me to start doubting (unless I sit down and purposefully set out to read against the grain). Of course, a detective saying "well, they could have done it" is one of those signals. And I rather enjoy it when it happens. The book is of course set at Christmas. More specifically, Sir Osmond Melbury, who enjoys controlling his children and dependants and is therefore prime murder victim material, has decided the entire family must meet at his country residence of Flaxmere. When he is, unsurprisingly, murdered by a bullet to the head, Santa Klaus (not Claus, and certainly not Father Christmas, because according to Sir Osmond that was just some nonsense invented during the First World War in order to make him sound less German) is apparently the only suspect. Unfortunately, the person who played Santa Claus is also the only person without a motive. To make matters worse, Sir Osmond has been toying with the idea of making a new will (he really should have read more detective fiction; then he would know that is a terrible idea). I won't spoil the ending, but I will admit that while the murderer was on my list of suspects, pretty much everyone else was, too. I think one of the things that make the book so readable is that in addition to the central mystery of the murder, there are enough other secrets and plots to be unwound by the detective figure along the way. It is also interesting as a historical text, placed between the world wars and not only suggesting the nostalgia for the pre-war period, but also showing the lasting effects of the first war (with amongst others a shell-shocked veteran called Evershot as one of the central cast). Call it the love child of Ellery Queen and Wilkie Collins, raised by Agatha Christie; or call it a lovely bit of murder over the holiday. At any rate, I recommend reading it. Vi har jo påskekrim, så hvorfor ikke julekrim? Jeg tror jeg skal prøve meg på denne i julen, jeg liker jo i prinsippet bøker der man selv kan prøve å sette sammen informasjonen for å finne morderen, selv om jeg ikke er så flink til det som jeg skulle ønske.